Lest anyone think that SAARC might have been buried quietly, the heads of state and governments of member countries issued tributes marking its 34th Charter Day on December 8. Prime Minister KP Oli and Indian Prime Minister Narendra Modi, like their other South Asian counterparts, renewed commitment to realize the collective vision of a peaceful, prosperous and “integrated” South Asia. As things stand, the regional body is in a state of coma, primarily because of Indo-Pakistan tussle over Kashmir and its side-effects. Its potential has never come anywhere near being tapped for the collective benefit of a region that represents almost every fourth person on earth. Bangladesh and Pakistan alone account for a combined population of 420 million as against the population of 330 million in the United States. In fact, they account for nearly half of Europe’s population. But this region accounts for barely 3.3 percent of global economy. Not long ago, Oli told Yousaf Raza Gillani, visiting as Pakistan’s former Prime Minister, that he was “eager” to hand over SAARC chair to Pakistan. The summit is pending since 2016 on account of the running feud between New Delhi and Islamabad. In November, India snubbed Islamabad’s attempt at hosting the long-delayed summit. Hence, does SAARC await the prospect of dying into oblivion without any ceremony? Give it a decent burial or end the existing bilateral acrimony or indifference marking members. The rhetoric describing common ties as being “taller than mountains and deeper than the sea” mocks at the current condition of cooperation among eight member nations. 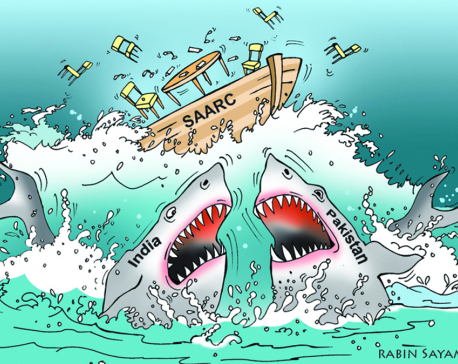 The running feud between the two largest nations in the region has rendered SAARC a casualty, deadlocked as it is since the summit’s deferment in 2016 when four countries chorused against it. The agreement on South Asia Free Trade Area came into effect in January 2006, but intraregional trade remains low. Connectivity with relatively far-off countries is forged whereas the far-from-close connectivity with immediate neighbors presents a painful paradox begging for remedying the situation for meaningful cooperation. A scramble for space in SAARC among big countries began after China debuted as the first observer, thanks to King Gyanendra’s push for its status for which he had to pay a heavy price on account of the chagrin it generated in India. Nepal no longer wields the weight its role and voice used to carry during earlier decades on the strength of its non-aligned and independent stand, maintaining balance, consistency and independence at international forums. 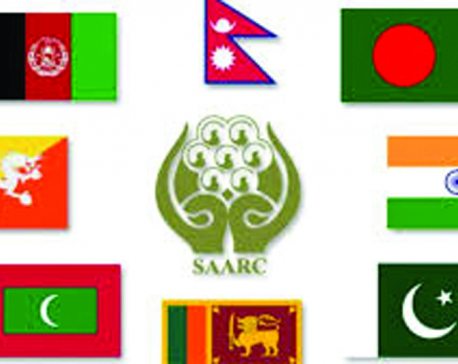 SAARC’s nine external observers—Australia, China, EU, Iran, Japan, Mauritius, Myanmar, South Korea and the United States—obtained their status between 2005 and 2008 before a halt was put to the expansion, at India’s initiative. Not to be left out, a number of others have also shown interest to get onboard. Turkey since 2012 and Russia since 2014 have their applications pending. Saudi Arabia and South Africa are also probing for similar opportunities. On the question of elevating Observer States to Dialogue Partners, a five-year moratorium on expanded status and new applicants was put in place in 2014. Those keen on being elevated to Dialogue Partnership are silent spectators to the inordinate delay in holding the 19th summit even in back-room discussions. More than a dozen international organizations share partnership with it. Multilateral agencies like UNICEF and UNCTAD share limited partnership with SAARC. Involving some members of this region, sub-regional and trans-regional endeavors have also taken off. Bay of Bengal Initiative for Multi-Sectoral Technical and Economic Cooperation (BIMSTEC), as well as well as Bangladesh, Bhutan, India and Nepal (BBIN) are basically creations of India’s initiatives. China and Pakistan are not associated with these groupings. Ironically, Rajiv Gandhi, the late Indian prime minister, had, at the time of SAARC’s launch in Dhaka, suggested a summit gathering every six months. King Birendra made a polite intervention: “Let us first experiment with annual summits. After the experience, we can revise the provision.” In subsequent decades, India is seen as responsible for much of the delay. The delay in summit dates is a reflection of New Delhi’s bilateral problems with one or the other neighbor. Formally launched in December 1985 with seven founding members, SAARC states are governed under different political systems. But poverty is a major common feature they all share. More than 40 percent of the world’s poverty-stricken people live in this region. When complaints began surfacing over SAARC’s inability to pace fast in the first decade, officials cited that ASEAN had taken nearly two decades to achieve high-yielding results. The reason could not be disputed. 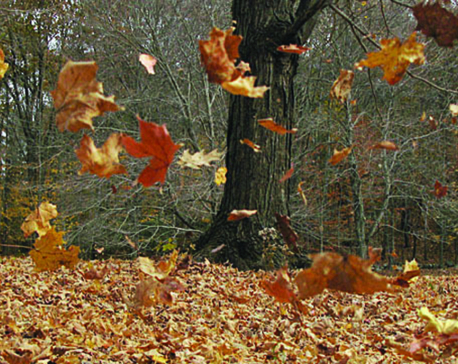 But not any longer—33 years after the organization made its debut with lofty promises. SAARC’s founding fathers included King Birendra (Nepal), President HM Ershad (Bangladesh), King Jigme Singhe Wangchuck (Bhutan), Prime Minister Rajiv Gandhi (India), President Maumoon Abdul Gayoom (Maldives), President Zia-ul Haq (Pakistan) and President JS Jayewardene (Sri Lanka). Assassinations, air accident under inexplicable circumstance, disgrace or abrupt abdication marked most founding fathers, with the exception of Jayewardene. Afghanistan joined the grouping more than two decades later. Prior to SAARC’s formal take-off, Nepal’s contributions to the regional concept can be gauged from the quiet diplomacy King Birendra conducted for a regional body. Bangladesh’s President Ziaur Rahman had broached the idea of regional cooperation to Indian Prime Minister Morarji Desai in 1977. King Birendra raised the issue the same year, calling for close cooperation in sharing water resources. China borders five of the eight SAARC member states. Its interest is indicated by the annual South Asia trade fair it organizes in Kunming, which engages in substantial trade with this region. But Chinese presence in South Asia generates hysteria in India and the West. India feels insecure by the next-door economic superpower emerging as number one and a military might significantly larger than its own whereas the West sees China as the power bound for ending its global dominance witnessed for at least three centuries, especially after the World War II. When India and Pakistan someday record a thaw in their distrust, they will need an exclusive regional platform for South Asian cooperation. There are many ifs and buts in-between, though. Speculations were rife from the very beginning that Myanmar and Afghanistan could join the SAARC. Myanmar eventually joined the much more successful and smoothly running ASEAN. Comments over some SAARC states losing interest in the regional body suggest that Pakistan might be looking toward the North in the context of SAARC bearing no substantive fruit. Afghanistan is also taking increased interest to be engaged in the North and also the West and Central Asia. It is no longer participating in South Asian Games as it has decided to focus on sporting competitions organized by the Central Asian region. The host Bangladesh in SAARC’s first summit in 1985 had introduced arrangement for a retreat where the leaders of the participating delegations were able to meet bilaterally or even in groups in order to broach new ideas, issues and initiatives. This aspect has drastically shrunk over the years. Considering that European Union and ASEAN have made many stunning strides and the frequent delays in SAARC summit schedules are attributed to New Delhi, the member countries should strive for at least having resident ambassadors in all member capitals and do the minimum of meeting the yearly conference provision. Just as contentious issues are barred from formal talks at the summit, the leaders should have the integrity and diplomatic decency to apply the principle of not allowing bilateral differences to cripple the regional body’s basic objectives.